The Court of Justice for the Economic Community of West Africa States (ECOWAS) has again postponed judgement in a fundamental rights case brought before it by indigenes of Benue State, Nigeria. The indigenes including a Catholic priest, Solomon Nfa, have asked the court to order the Nigerian government to pay them N1 trillion, for their losses in the series of killings recorded under the current administration. The case was brought against President Muhammadu Buhari, the Inspector General of Police, Ibrahim Idris and the Chief of Army Staff, Tukur Buratai. Other named applicants in the suit are Joseph Dooga, Sam Abah, David Iordaah, Ochepo Yakubu and Terese Tange. According to the application, the indigenes alleged outright neglect by Mr Buhari's administration and accused the military of compromising its constitutional role of protecting the people. The indigenes likened the killings in their state to an attempted genocide and accused the federal government and the military of 'watching', while Benue communities were attacked by the herdsmen. The ECOWAS court had resolved to deliver judgement in the matter since March, but postponed the judgement date twice, before beginning an annual vacation in July. On Wednesday, the court also noted that the expected judgement could not be delivered because the panel of judges attending to the matter had resigned. A counsel for the plaintiff, Vembe Terfa, also asked the court for time to submit his final addresses. Subsequently, the court decided to return in December to deliver the judgement in the matter. Although the precise date in December was not stated, the court said it would reconvene in the middle of next month. 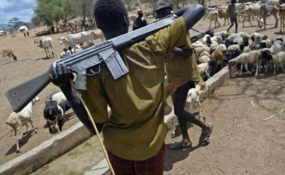 Benue State was affected by a series of attacks from suspected herdsmen since 2015, with the herders confirming they carried out some of the attacks. A PREMIUM TIMES investigation in 2016 revealed that the attacks had resulted in the deaths of over 1,000 people within the state. Also in January, 70 victims of suspected herdsmen attacks were buried in mass graves.